● The homepage occasionally features a variety of special promos, which have previously included seasonal sales, contests and sweepstakes. ● Check out the Packages page to take advantage of several money-saving hotel and event deals. ● The company occasionally offers a variety of incentives for subscribing to its newsletter. In the past, these have included exclusive deals and promos. ● The company usually offers special discounts of up to 15% off for active military personnel and AAA members. This offer seems ongoing, but may be discontinued or modified at any time, without prior notice. ● The company has a best rate guarantee: if you find a lower published rate on another site, the company promises beat the lower rate by 10% after verification. The official website for Palms Casino Resort offers much in the way of information, packages, and the ability to make your bookings in advance. You can use the Palms Casino Resort to learn about the rooms themselves, or you can use the website to learn more about the casino side of things. You can also find out what kind of shows are going on at the casino's famous Pearl Theater facility. In addition to all of this, you can explore everything else the casino has to offer. You can even find out more about the kind of menu that is currently being featured at the casino. Group information is also available. 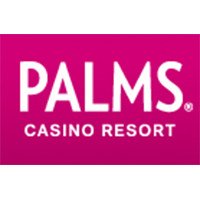 For most up to date offers check out Palms Casino Resort on Facebook and Twitter or contact Palms Casino Resort Support for any questions.